Aluminum floor jacks tend to possess ton capacities equal to the capacities of steel jacks, yet are generally lighter than steel jacks. This is a big plus for DIYers who must lift their own jack using sheer muscle. 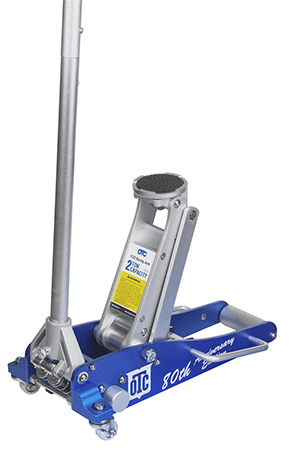 Mostly used versions of the TruePower 1.5-ton aluminum jack are available now. Max lift height is 14 3/4 inches, which isn’t ideal for SUVs. A saddle height of 3 1/8 inches suits most lowered vehicle designs, such as sports cars. This floor jack has dual-side handles to simplify maneuvering, while its alloy-plated hydraulics withstand wear and tear for lasting durability. The Torin racing jack is an aluminum/steel hybrid, medium to lightweight yet heavy duty. Its lift height range of 4 to 18 inches is useful for most vehicles, excluding most SUVs. 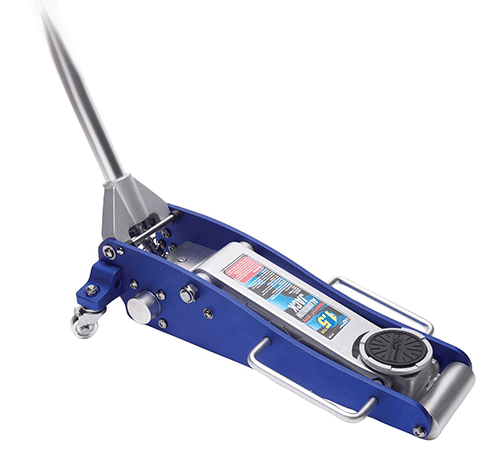 With quick-lift technology, this floor jack goes to max height in seven strokes. A 2.5-ton capacity is good news, but the overall jack’s weight of 60 pounds might prove taxing. The Sunex 3-ton service jack is aluminum but hardy enough for big jobs, such as trucks. This floor jack weighs 58 pounds. Its safety valve prevents overloading, while a foam handle bumper protects vehicles from dings and scratches. 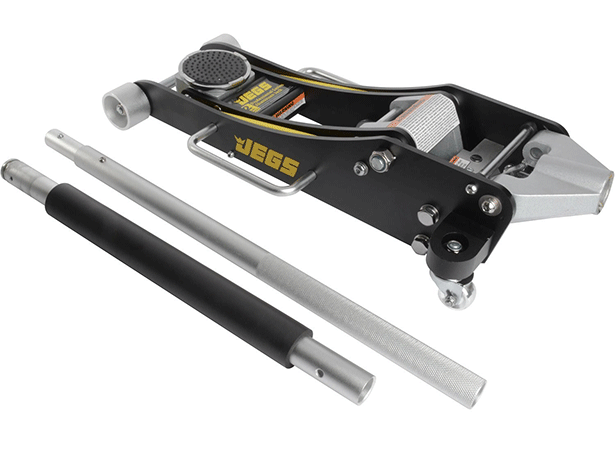 Jegs low-profile aluminum floor jack is a professional-quality floor jack engineered primarily for 1- to 2-ton (2,000 to 4,000 pounds) low-clearance vehicles. Even so, the maximum lift height is a whopping 19 1/4 inches, which potentially suits high trucks and SUVs. This floor jack has a 360-degree rotating rubber lift pad that prevents marring, while a knurled grip area minimizes slippage. 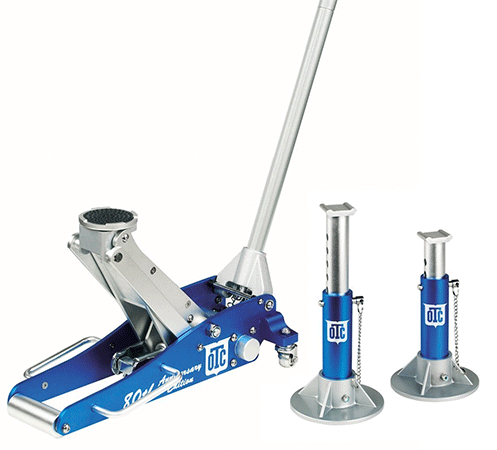 The OTC aircraft-grade aluminum racing jack kit is high-quality treat, containing a 2-ton aluminum jack and two 2-ton aluminum stands. Its low-profile and max lift height of 18 inches are great for ground-hugging sports vehicles. Dual pistons achieve max lift height in five pumps. 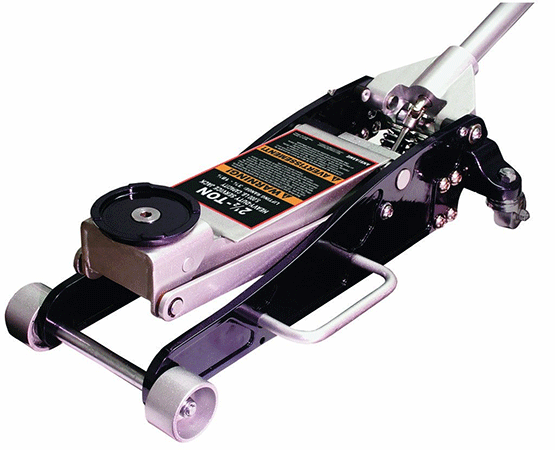 Weighing about 43 pounds, this floor jack is also suitable for working on racing machines and tuners. The Performance Tool W1630 floor jack emphasizes speed, achieving its max lift height of 17 1/2 inches in three pumps. 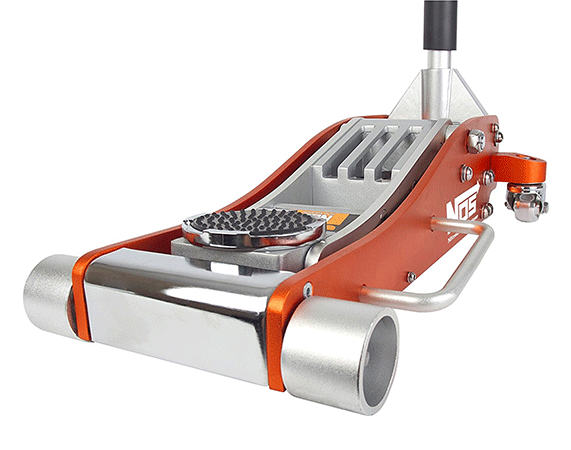 This floor jack is made of lightweight aircraft-grade aluminum and comfortably lifts up to 3,000 pounds. Its overload protection bypass ensures smooth action during lifting, while a rubber-cushioned saddle and swivel wheels maximize easy maneuvering. Like the above floor jack, the OTC racing jack matches the needs of quick jobs, achieving its max lift height of 18 inches in five pumps. The max lift height falls slightly short of the height you’d need for an SUV, but this jack’s aircraft-grade aluminum, 2-ton capacity and 3 1/2-inch low profile are ideal for trucks and low-to-the-ground vehicles. 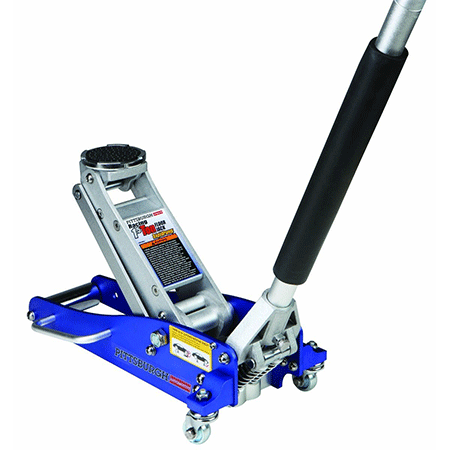 This is a solid floor jack for home use, busy free lance work or standard/routine maintenance on sports cars. The removable rubber saddle is good news, as it protects vehicles and prevents slippage. Apparently size matters, because this 1.5-ton racing jack is compact and cheap. 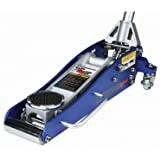 Clocking in a mere 31 pounds, this floor jack is your basic everyday DIY model, great for advantageous owners who like to tweak/repair their own rides. It’s also easier to lift/maneuver, which increases its viability during emergency roadside tire changes. Lift height range is 3 to 14 inches, achieving max lift height in 3.5 pumps. 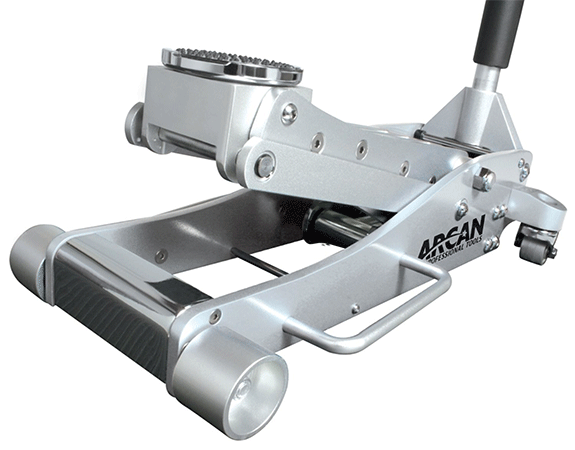 Despite its 3-ton capacity, the Arcan floor jack weighs just 56 pounds. Its lift height range goes from 3.6 to 19.4 inches, which just might be okay for lower SUVs. Dual-pump pistons make for quick rising action, although a bypass and overload valves prevent overextension. Swivel caster wheels allow for fuss-free maneuvering. 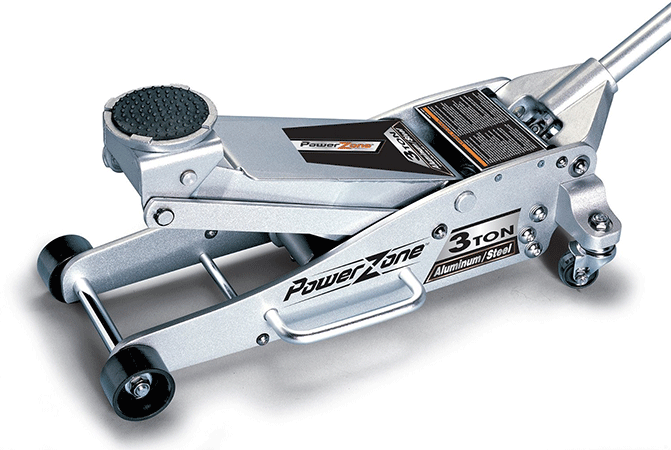 The Powerzone 3-ton steel/aluminum floor jack is for those who want professional quality at DIY prices. 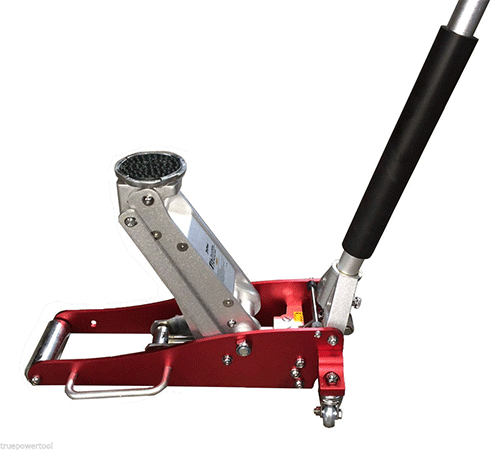 This floor jack lifts up to 6,000 pounds using a hydraulic arm that is swift and quiet. A safety valve prevents overloading, a foam-covered handle protects your vehicle frame, and swivel wheels move and slip into position smoothly. If you’re in the market for a lightweight yet heavy duty floor jack, then consider one of the above. Bear in mind the vehicles you intend to service, your goldilocks price point and additional features, such as coated parts for corrosion-resistance. Use your needs as guiding criteria, and then narrow your choices according to your most vital requirements.